It was one of those chilly, drizzling kind of days that don’t do much to motivate you to get out. So, I didn’t go out, at least not until later in the evening. And then I didn’t go far. A new place had opened up in my neighborhood so I thought I would just stroll down Atlantic Avenue a few blocks and pop in. 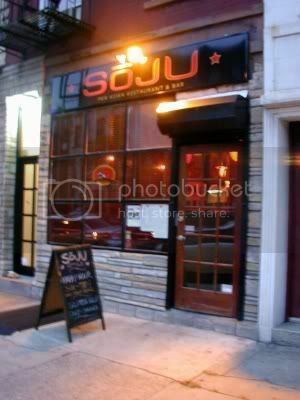 This restaurant and bar named after a Korean liquor is located at 145 Atlantic Avenue. It is fairly small but dramatically decorated with a decidedly Asian bent. A heavy wooden top to the bar that also has a heavy wooden front. The bar chairs are also wood and some of them have red cushioned seats. The wall directly behind the bar is brick with a single wooden column in the center with three wooden shelves sprouting from each side. Bottles of sake and the stronger soju (soju is distilled whereas sake is brewed) and other unknown wines and liquors sit on them along with glasses, candles, a Buddha like statue, and what look like some skull shot glasses (not particularly Asian). A large bouquet of flowers sits on one end of the bar and a couple of stalks of lucky bamboo sit on the other end. The lights over the bar are classic style lanterns complete with red tassels. 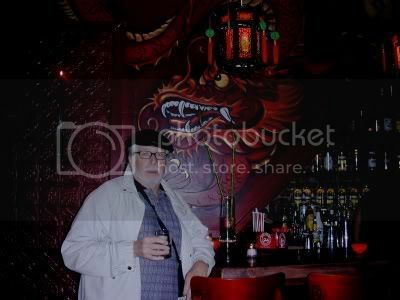 To the left of the bar is a painting of a dragon head that would make a good design for a tattoo. Wine bottles with candles in them are mounted on the wall on the bar side of the room. There are also little candles on the bar. Hanging from the ceiling in front of the bar have exposed bulbs but are surrounded by curved, almost shell-like sculptured shades that surround them. A row of tables along the wall opposite the bar sit in front of a wooden bench and have small wooden chairs with black sits on the other side of them. Little candles sit on the tables. The walls are deep red and have small lights mounted on them with the same shell-shaped shades around them that the ones hanging from the ceiling had. They also have red tassels hanging from them. The bartender was quite friendly and we chatted a bit about the neighborhood and how much it has changed. He used to live in the neighborhood. The only minor complaint that I have is that they serve the sake in small water glasses so when you get a drink the glass is only filled about a third of the way. Sake should really be served in a smaller glass set in a wooden box and the glass should be filled to overflowing. That is the traditional way. I got there when the place first opened, shortly after 6:00 P.M. and I and the Mysterious Chinese Woman were the only two people in there. We decided to stay for dinner so I ordered a bottle of sake to go with the meal. 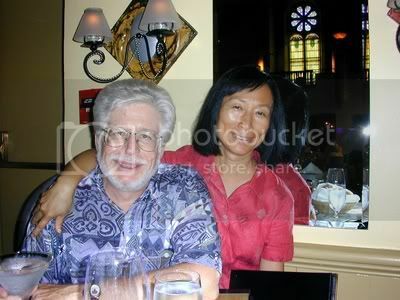 By the time we left the place had pretty much filled up so business must be good for this relatively new restaurant. I had a glass of Fu-Ki Sake at the bar and then half of a bottle with dinner. I finished it off after I got home though. Once its been opened, well you know it won’t keep. At least not in Bar Man’s house. Just one bar for the day bringing the total to 888 and leaving 112 to go. This neighborhood looked promising yesterday so I figured I would head back again. I think I will be sticking around here for awhile because there are a lot of bars in this vicinity. In fact when I finished up today I passed another eight just on the way back to the subway. And I am still on 3rd Avenue. I know there are plenty more just a block away. Know I know how the Indians must have felt when they ran into a herd of buffalo. Hah Hah, get it, Indians, buffalo, Hunters. Jeez, I am so clever sometimes it astounds even me. 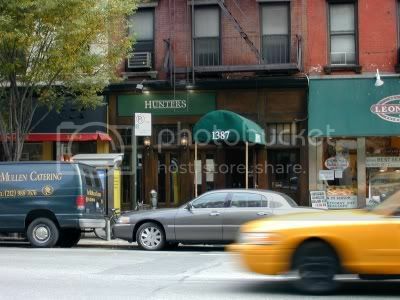 Hunters is a classic Irish bar on 3rd Avenue between 78th and 79th Streets. It has a good sized, well appointed dining area n the back and a good sized dark wooden bar with a brass rail and well-worn bar chairs up front. There is a plain T shaped beer station on the bar with five spigots. The bar back is old wood that matches that of the bar and looks like it was built at the same time. In the center is a breakfront with a little mirror and a shelf above. On either side are narrow shelves. Glasses sit on the top shelf and bottles of the beer they sell sit on the small shelves to each side. Spreading out from the breakfront on each side are tiered shelves holding the liquor and they elevated on brass pipe. Glasses are stored below them. There are also a fair number of wine bottles on display. In fact there was a wine salesman in here eating lunch and pushing his wares. Drawers and coolers with wooden doors sit down below along with recessed tiered shelves holding more liquor. Most of the wall behind the bar is mirrored with a brick section on one side up front by the wood-framed French doors. There are a couple of somewhat sorry looking plants on some kind on either side of the doors. They are quite tall with droopy, although still green, leaves. The wall opposite the bar is pale green with wood paneling going up about waist height with a ledge with bar stools in front. On the wall is a mirror flanked by light fixtures, each with two small candle-like lights with dark shades. I had a Bass Ale. A cute little Italian restaurant a few blocks away at 1396 3rd Avenue that has a small bar topped with pink marble with green veins running through it. It looked kind of like an old ladies legs. No, No, I was just kidding. It looked quite nice. And, yes, I know, old men have legs like that too. The front of the bar is wood and the foot rest is black and brown marble. Just four black metal barstools with forest green seats. The marble of the bar wraps around behind the bar and wooden cabinets sit on top. To the right, by the door, there is a narrow ledge of marble where the bottles of the wine they serve by the glass sit. To the right are glass shelves holding wine glasses. Directly behind the bar are mirror backed tiered shelves that hold the liquor. Right in the center is a cabinet with glass doors that hold the sweeter, after-dinner liquors. At each end of the tiered shelves are narrow shelves holding more exotic brandies and one blue bottle of tequila. Hanging over the bar are truncated cone shaped, frosted orange glass shaded lights. Elsewhere chandeliers that look a bit like twisted vines hang from the ceiling. Each sports six lights in upturned cone shaped shades. The walls are a washed yellow and sport little versions the chandeliers with two lights each. There are also small wooden shelves mounted on them with wine bottles, a nicely framed mirror, and paintings of what looks to be a seaside Italian village. I had a glass of red wine, Capestrano Montepulciano d’Abruzzo, very nice. 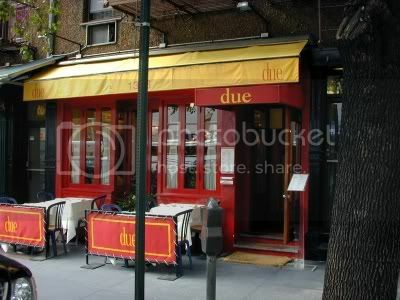 And a very nice looking restaurant that I wouldn’t mind visiting again. Just next door is this kind of a combination Irish bar and a restaurant that wouldn’t look out of place up North somewhere. It is a bit hard to describe the ambience exactly. The bar looks like one you would find in and Irish pub, dark wood with a wooden footrest and wooden bar chairs with oxblood seats affixed with large headed brass tacks. The back bar was pretty standard tooo, wooden cabinets and shelves. A bit fancier than most though with small oval mirrors above the tiered shelves of liquor. Little cabinets with glass paneled doors sit at each end and there is one in the middle as well. At each corner of the sections with the mirrors is a small shelf, each holding two or three bottles. Down below are shelves of glasses. Above the entire width of the bar back is a narrow panel of slightly angled mirrors. Down below are shelves of glasses. One tee shaped beer station sits on the bar with six beer spigots. The lights hanging above the bar are almost Asian in appearance, square old looking orange glass framed in metal with a pagoda like metal top. The rest of the place is what looks more like a diner. Wood paneling goes half way up the walls and there are hooks for hanging your coats very Northern Minnesota. Above the paneling the walls are pale yellow with a few narrow mirrors with thick wooden frames. A wide assortment of small framed prints, most depicting scenes from a bygone era also adorn the walls. The small tables have green and white checkered tablecloths and are surrounded by wooden chairs. The lights over the tables are the squat with-shaded ones that look, to me, like the ones you would find in an old schoolhouse. The floor is old wood. It is a nice, cozy place with a family type of crowd enjoying lunch. I had a glass of Samuel Adams Octoberfest. Another nice day, three pleasant bars hit making 887 for the year and leaving 113 to go. I decided to head uptown a bit further than I normally do to see what I could see. It looks to be another very fertile area just ripe for the farming. 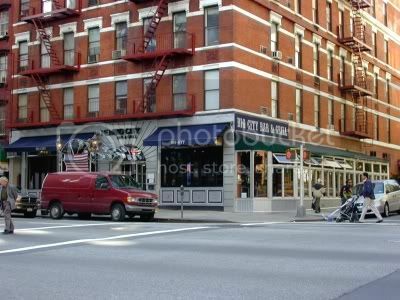 New Big City is located at the corner of 90th Street and 3rd Avenue. A good sized bar with a large adjacent dining area up a couple of steps and separated from the bar area by two interesting columns. They are white blocks that are separated by narrow metal bands on each side of glass blocks. The glass blocks are lit from within and slowly change color. On the outside edge of each column is a light in a rippled glass fixture that also changes colors, but not in synch with the blocks. Cool. On top of the glass blocks sit small televisions of about the same width. The bar is dark wood and has a bit of a fishhook shape to it. The “hook” part is down by the front and a side window. There is a wooden foot ledge and both bar stools and bar chairs. Five beer stations sit on the bar. Four of them are ornate silver affairs with six spigots each. The one in the center is a fancy dark green ceramic and has only two spigots. There are five televisions of varying sizes mounted behind the bar and another one in the corner by the door. Behind the bar are windows and tiered shelves of liquor sit below them. Separating the windows are column-like shelves holding a few additional bottles, glasses, and the cash registers. Hanging over the bar are carriage style lights and set further back on the ceiling are paneled lights that match the glass blocks and also change colors. All in all a pretty neat place. I had a pint of Samuel Adams Lager. 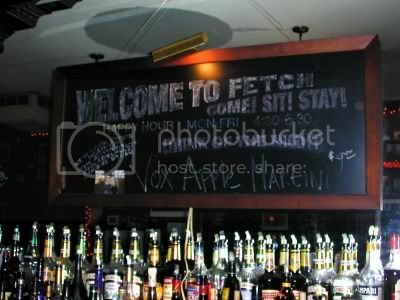 Fetch, at 1649 3rd Avenue is the place to go if you like dogs, or at least if you like pictures of dogs. They are everywhere. Hundreds, if not thousands, of pictures of dogs. The owner really likes dogs. 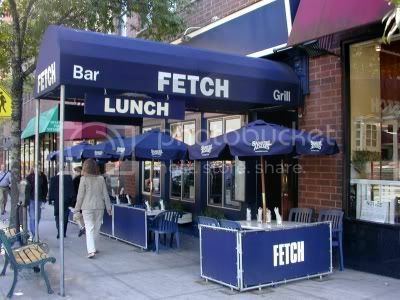 Fetch works with city shelters and rescue organizations like ASPCA, Humane Society, Stray from the Heart, and Animal Haven. Once a month they host animal adoptions and then contribute $1 for each beer sold to these organizations. The owner also raised money for dogs that were left homeless in the aftermath of hurricane Katrina and even adopted one of them himself, a St. Bernard and German Shepherd mix. I didn’t get to meet him but the very friendly bartender, Lindsay, told me all about it. The beer station on the bar is enclosed in a wooden box that has, one guess, pictures of dogs on top. Pale yellow stained glass shaded lights hang over the bar. Opposite the bar is a ceiling high divider that separates the bar area from the dining area. It is wood-paneled to about waist height and has a ledge with stools in front of it. The wall above, like the rest of the walls in here, is deep rose and has a couple of mirrors and a couple of hundred pictures of dogs. Jack-O-Lanterns carved out of real pumpkins sit on the ledge and in front of the slightly recessed mirrors. This was a very friendly place with a real homey feel to it. 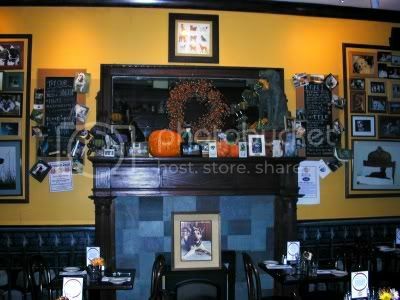 The dining room looked quite cozy with a fireplace decked out for Halloween and the walls covered with even more pictures of dogs. You really need to see this place to believe it. I had a Flying Dog (what else) Original Pale Ale. On 3rd Avenue between 93rd and 94th Streets is this large, brightly colored place that attempts to capture a Caribbean atmosphere. It doesn’t do a bad job of it but is a bit too spacious and not nearly cluttered enough to pull it off completely. There is also a baby blue torpedo hanging from the ceiling up front so I am not sure where that fits in. The bar has a wood textured plastic top with a pewter colored edging that acts as an armrest. The foot rest is wooden. The wooden bar chairs have lemon colored seats. The wall above the windows in front is lemon yellow and has a picture of a parrot on it. Behind the bar are three wooden sets of shelves separated by mirrors that go to the ceiling. The shelves hold wine in narrow wine racks and displays the bottled beer. Tiered shelves of liquor sit in front of the mirrors. On one of the mirrors they advertise the daily drink special, a Caramel Martini. I had to ask, and wish I hadn’t, it is Vodka, Butterscotch Schnapps, and milk. I think I will pass on that one. A narrow stretch of wall to the left of the shelves is brick and has a large ceramic mosaic of a swordfish on it. There are two televisions above the bar set at a slight angle to each other. There is a large chest full of ice and bottles of beer behind the bar. Opposite the bar booths with red high-backed benches line the wall that is painted in bright multi-colored strips. Pictures of surfers and posters from surfer movies hang on the wall. There is also a small dining area in the back that is up several steps. I had a bottle of Carib Lager with a slice of lime in it. A fun day with three bars hit bringing the yearly total to 884 for the year leaving but 116 to go. Well, I am back in New York and ready to resume my journey. Had a lovely anniversary yesterday. Went to see Wallace & Gromit: Curse of the Were-Rabbit, then popped into Brazen Head for a beer before going to Jolie, a nice French restaurant in our neighborhood. I have been there before so this time I could have my pre-dinner martini at the table. Very nice restaurant and their pirxe-fix dinner was reasonably priced at $25 with paired wine with each of the three courses for only $12 more. But that was so yesterday. Today I decided to head to Hell’s Kitchen, kind of the sink or swim approach to getting back on track. A colorful place, at least on the outside, located at 421 Ninth Avenue between 33rd and 34th Streets. I first heard about this bar from a bartender, Billy, at Bellvue. He also works here and his business card lists both bars. I thought the two bars were related but, other than the fact that Billy works at both of them, they are not. I found this out from Mr. Pat Lunney Jr., a part owner. 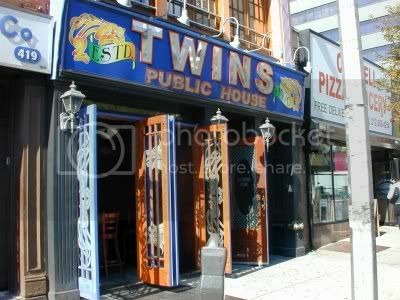 In fact, the bar was named Twins by his father because Pat has a twin brother. 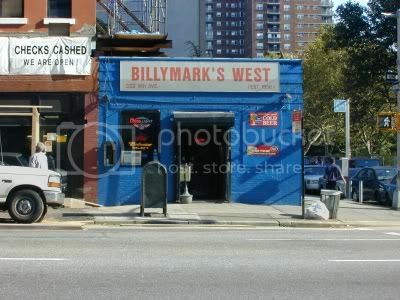 This is, perhaps, one of the biggest cop bars in New York, at least according to the bartender, not Billy, who was working there. Given that it was just a bit after noon when I got there the place wasn’t packed, but it was doing a brisk business. There is a long wooden bar with a short section by the front French doors that had room for another two chairs. The bar chairs are wooden with black seats. It is a beautiful fall day and the doors are all open. Quite pleasant despite a bit of street noise. The bar is broken up into three sections by partitions with little windows in them. All the wood in here matches the bar which has a reddish hue to it. Quite nice. The wall behind the bar is all wood with a few mirrors and three nice flat-screen televisions. Tiered shelves atop wooden cabinets hold the liquor. The cabinets have doors and drawers and match the bar and the wall. There are Halloween decorations, black and orange balloons, cobwebs, a skeleton or two, and a couple of small coffins. Very festive. The wall opposite the bar has wood paneling foing up about three feet and the wall above that is pale green. Sports pictures hang on the wall and there is an interesting wooden relief of the Rangers, one of whom is holding up the Stanley Cup. There is a small dining area in the back. 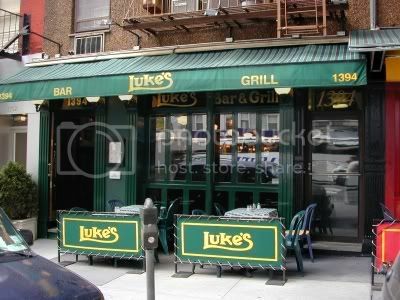 All in all it was a good place to pop into for my first “new” New York bar since returning from Spain. I had a Bass Ale. This is one of the old Blarney Stone’s that has not undergone a transformation into a fancier place. It is what it always was, a semi-dive bar. It is right across the street form the Post Office so it had a lot of postal workers having a libation, or two, or three, or more. A major discussion was taking place about whether the front door should be left open. Apparently there was some concern that a postal supervisor would pass by and spot them. I guess this means that at least some of them were on-the-clock and at least one, the one most concerned about the open door, certainly was in no condition to return to work. There were five televisions and another major discussion involved how many, if any, would be tuned to Star Trek. Actually, this was a pretty loud and argumentative, in a friendly way, crowd. Another major discussion involved just where the boundary between Brooklyn and Queens was. I don’t think I have ever met anyone who knows this for sure. There is a beat-up wooden bar with plain barstools. Typical behind the bar setup with tiered shelves of liquor above metal coolers. They keep the frosted mugs in the back room though. There were autographed pictures of sports figures above the bar and a few, cheap plastic, Halloween decorations. I went next door to write-up my notes. I thought they might suspect I was an undercover postal inspector if I starting writing anything down while I was in there. I had a bottle of Budweiser, in a frosted mug. 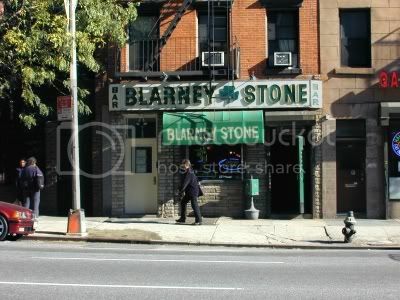 This is another semi-dive bar just a few doors down from Blarney Stone at the corner of 9th and 32nd. It is a much larger place that has a bar with a black top and front. Kind of a green marble foot rest. Metal bar stools with black, round, swiveling seats. The wall behind the bar is paneled with mirrors and there are a couple of framed gold records by people that I have never heard of. A skeleton wearing beads sat a black shelf behind the bar. It looked like it was a permanent fixture and not brought out just for Halloween. Just the standard set of tiered shelves with liquor behind the bar. More postal workers in here and they are hollering too. Well, to be fair, the guy doing the hollering isn’t a postal worker because he said he had to go to leave and go to work. He was just loaded and talking loudly. He, apparently, works for the railroad. At least he isn’t a pilot or something. One of the people was a retired postal worker and I think her friend invited her to stop in for a drink. The walls are covered with pictures and movie posters. It is kind of bright and cheery in here, particularly up front by the windows with the bright fall sun streaming in. Somehow it seems like it should be darker. In the back is a pool table with blue felt and up front is a dart board. I had a Budweiser, straight from the bottle, like a man, or at least like a Bar Man. Well, three bars on my first day back, about the number I plan on doing each day from here on out. This was a nice little stretch in Hell’s Kitchen so, if you are in the neighborhood and want to hit a few bars, I can recommend them. 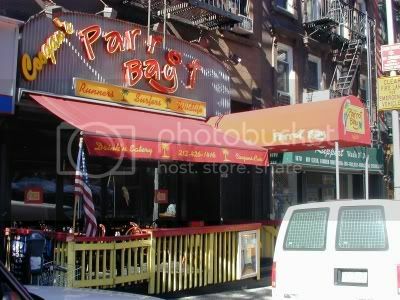 They are just a short walk west from Penn Station. Bar Man is taking the day off to celebrate his anniversary with the Mysterious Chinese Woman, she who tolerates and, dare I say, sometimes encourages this adventure. I shall resume my travels tomorrow, rest assured.